2150 sqft on main level, large principal rooms & stone wood-burning fireplace. Patio doors to deck overlooking creek & springs. 3 bdrm, 2 bath plus master ensuite. Main floor laundry. 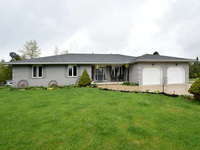 Lower level open concept, patio doors & 2nd wood-burning stone fireplace, exercise room &workshop. Geothermal heat.